A NICE FIT: Princeton University's sixth residential dorm, the $136 million, 250,000-square-foot Whitman College, officially began housing undergraduate students this past week. The residence facility is part of an overall change in campus philosophy that encourages students to participate in a four-year residential college system, rather than students' eventual ascension to residential housing strictly for upperclassmen. Whitman lies on the site formerly occupied by PU's "Pagoda" tennis courts. Architects strove for a blending of campus atmosphere and architecture in designing the facility, with the University transporting mature trees to the site. 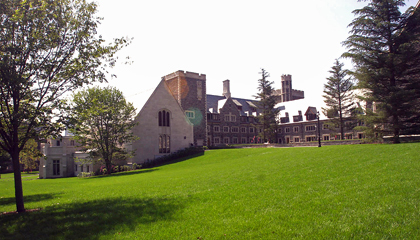 With its veritable forest of mature trees, Collegiate Gothic architectural style, and seamless blend into campus building infrastructure, Princeton University's newly opened Whitman College, the school's sixth residential college, could well have been part of the campus for decades. The New Jersey Historical Commission, a division of the Department of State, has awarded a total of $3,440,000 in general operating grants to 83 historical organizations from every county in the state, including the Historical Society of Princeton and the David Sarnoff Library. Princeton Borough is known for a lot of things that readers of this local weekly don't need to have pointed out to them, but a quick Google search, up to this week, provided something less than quality service in outlining Princeton Borough's attractions to people outside of the region. "An amazing adventure." That's how Natalie Morawsky described the cross-country bicycle ride that she began on May 20 when she dipped her back tire in the Atlantic Ocean and ended three months later when she dipped her front tire in the Pacific. Ms. Morawsky, who grew up in northern New Jersey and lives with her husband Paul Mudge on Governors Lane, took a leave of absence from her job with National Starch and Chemical to undertake the trip. Remember Alice from the Brady Bunch? Alice was the ultimate sitcom prototype. The kind of person you could turn to when you had trouble with your annoying, more popular sibling, when you were suffering from marital strife, or just when you needed a hot meal. Alice had it all, and rarely showed fatigue, unless, of course, for comic relief, evoking reaction from a laugh track. "Princeton in the 1930s," opened Tuesday, September 11, at the Historical Society of Princeton (HSP). It will be on view in Bainbridge House on Nassau Street through July 13, 2008. Curators Howard Green and Julia Williams  the couple responsible for the "Princeton's Civil War" exhibition, which ran from last October through July  have again brought together various elements from the historical society's collections.